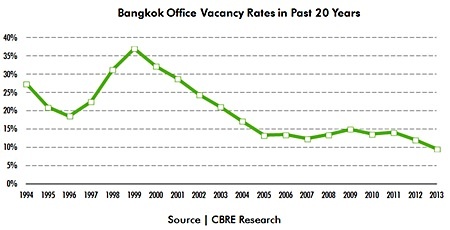 Growth in demand for office space in Bangkok during 2013, combined with limited new supply, resulted in vacancy rates falling below 10% for the first time in 20 years, according to international real estate advisor CBRE Thailand. 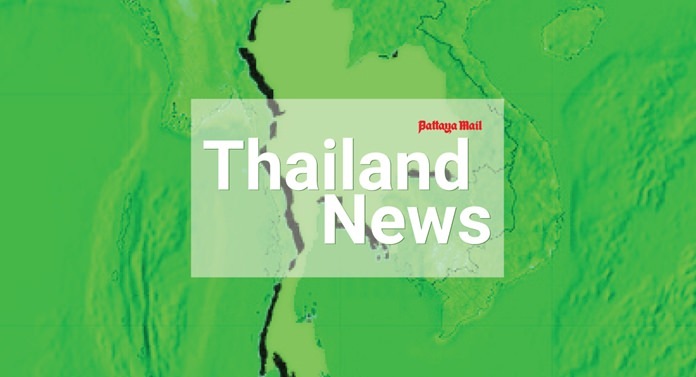 “The total office stock in Bangkok was 8.1 million square metres at the end of 2013 and the occupancy rate was 90.4%. Occupancy improved in all locations and all grades. Rents rose between 5% – 9% Year-on-Year, depending on quality and location of the building,” said James Pitchon, Executive Director – Head of CBRE Research and Consulting. 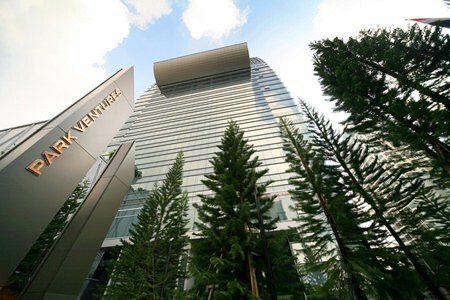 Park Ventures on Wireless Road in Bangkok is the most expensive office building in Bangkok with rents of THB 1,000 per square metre. The total amount of occupied office space rose by 220,000 square metres in 2013 which was the best performance since 2005. There is only 450,000 square metres of new office space under construction due to be completed between now and 2016. Some of this new space will be owner-occupied and not available for rent. 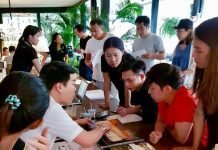 High occupancy and limited new supply means that office rents in Bangkok are likely to rise further and that tenants will have limited choice. The shortage of space especially for larger requirements has meant that tenants have been pre-letting in buildings under construction. Only two new Grade A buildings will be completed in 2014: AIA Capital Center, a LEED Gold building on Ratchadapisek Road will be completed in Q3 2014 while Bhiraj Tower at EmQuartier, located opposite to Emporium on Sukhumvit at the Phrom Phong BTS station will be completed in Q4 2014. Both of these two buildings already have tenants who have committed to lease space. 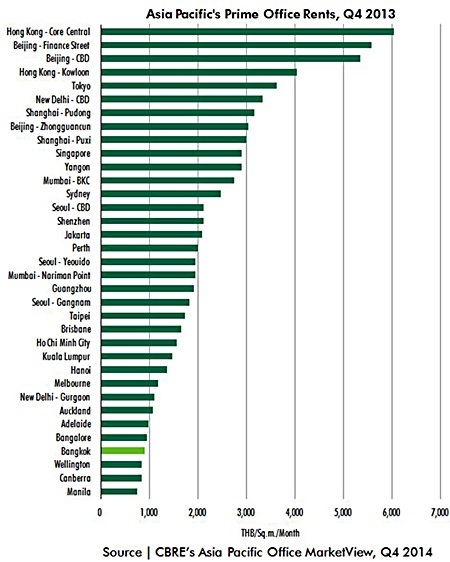 The CBRE report says that Bangkok is still competitive as it remains one of the cheapest office locations in the region; only Manila, Wellington and Canberra are cheaper. Core Central Hong Kong office rents are six times more expensive than the best offices in Bangkok. 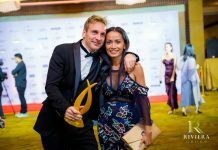 Park Ventures on the corner of Wireless and Ploenchit Roads retained its position as the most expensive office building in Bangkok with rents of THB 1,000 per square metre. The outlook for demand in 2014 is more uncertain because of the political situation.